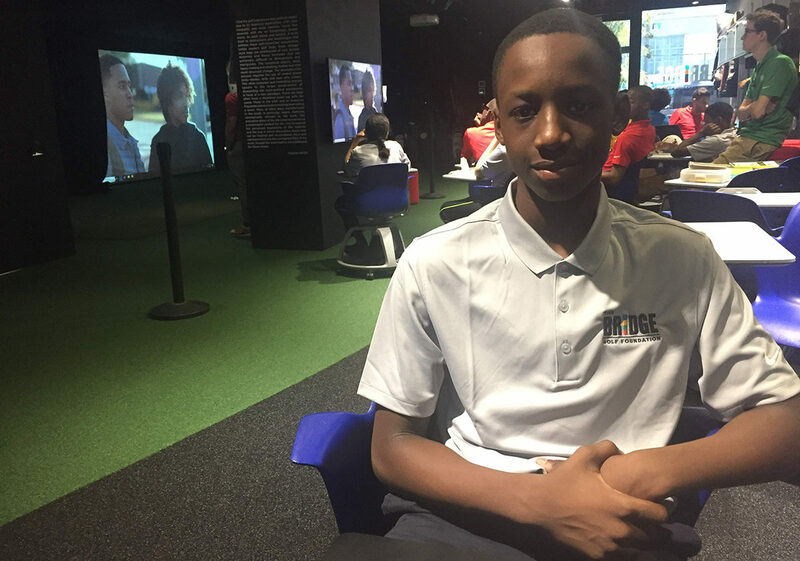 Josh Arthur is one of 10 rising 8th graders from the Eagle Academy for Young Men of Harlem to join our program this summer. He’s 13 and lives with his mom and 15-year-old brother in Harlem. His dad and 9-year-old half brother live in Brooklyn. He recently fielded some questions from Charlie Hanger, our digital content manager. CH: Who are the most important people in your life? JA: My mom, my dad, my brothers, my grandma, my aunts. Everyone in my family is important to me because they care about me and they always come to my events and they’re always around. CH: What are some of the things you like to do as a family? JA: We go out to eat for special occasions, and we go to beaches and water parks. My dad is planning a trip to a water park in Pennsylvania. He lives in Brooklyn, but I still see him a lot. JA: I knew about the program because the Foundation comes into our school during the school year. My mom talked to our assistant principal about different programs in our school, and he recommended me for it. I also know Braylan Stewart. I thought golf sounded interesting, but I didn’t want to do it because I didn’t want it to interfere with baseball. But then my mom said I could do both. CH: We don’t have many baseball players in our program. Tell us about that. JA: I was MVP for my team in Harlem Little League. I play center field and left field. I hit two out-of-the-park home runs in a row in one game, and I made the tournament team, which is like an all-star team. We played in one tournament in the city and got eliminated, but we’re going to play in another one this summer. 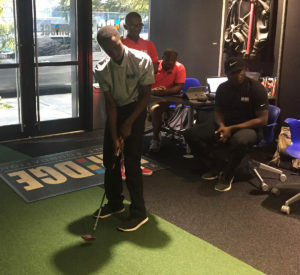 Josh in a putting competition during a recent session of our summer program. CH: I know you just started playing golf, but so far, how is it similar and different from baseball? JA: It’s similar how you move your body in the golf swing. One difference is you have to aim lower. The grip is not the same because both thumbs are pointing the same direction; in baseball, your knuckles have to be lined up. CH: Our summer program runs from 9am to 1:30pm Monday to Friday. That’s a big commitment. How do you like it so far? JA: So far it doesn’t bother me because my plan for the summer was to practice baseball for next year, and I’m still doing that because we get done early enough. So I have the rest of the day to practice and have fun. I really like character education, too, since we’re watching and talking about Black Lightning. The show is about a superhero in a city that has constant problems like drugs, people that sell drugs, and sometimes people are in danger. Black Lightning has to save the city from the dealers. We’ve talked about how you have to sacrifice what you love sometimes and how you don’t have to have superpowers to be a hero. CH: What STEM lessons have you enjoyed the most? JA: We did coding and with Charlie Cohen, and it was hard, but I’m still getting the hang of it and I think it’s going to be fun. CH: The question all grown-ups ask: What do you want to do when you grow up? JA: I want to be a baseball player in MLB or overseas, or be chief executive of a company, or own a sporting business like Modell’s or a food company. CH: What are your other interests? JA: I read comic books and novels. I like the X-Men and Avengers Secret Wars. I also like video games, and I’m a fan of the Yankees and the Lakers. The Yankees are the best team right now, and I started liking them when I was 7 or 8 because they had the most titles and Jeter. Now I like them because of Stanton and Judge. When I was younger I started liking the Lakers because of Kobe. Every time I watched them, he made amazing shots.